our companion website for Advisors. 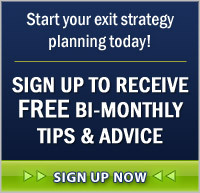 Start your exit strategy planning today! We are always interested in hearing your questions or comments regarding Exit Strategy planning. Feel free to contact us and someone from the Pinnacle Team will get in touch with you shortly. Note that * = required field. Privacy: We never rent, trade, or sell your information.